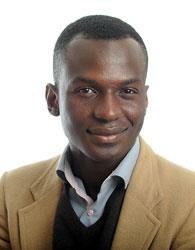 Dr. Ibrahim Cissé has been named as one of several recipients nationwide of the 2014 NIH Director’s New Innovator Award. This award is a five-year, $2.34 million which supports exceptionally creative new investigators who propose highly innovative projects that have the potential for unusually high impact. Dr. Ibrahim Cissé received his PhD from the Physics Department at the University of Illinois at Urbana-Champaign in December 2009 and is an Assistant Professor of Physics with the MIT Department of Physics.